"I'd like to put a shoebox on my lap and give you a puppet show." Some of the first words out of Bob Saget's mouth on this 2007 HBO standup special are "shut the f*** up!" and that's the immediate tipping point for the next hour, as the guy with the clean cut television image (see Full House or America's Funniest Home Videos) goes full bore the other direction. But this isn't anything new, as Saget has long been known as the antithesis of his squeaky television persona on stage (see The Aristocrats), though That Ain't Right may just blow the hair back on those unsuspecting viewers who pick this one up just because they see a familiar TV face. Nearly every line has some salty language, something that Saget seems to revel in as he covers the typical standup territory (his parents, his children), as well as the expected knocks on Full House and America's Funniest Home Videos. The oddity of blue humor spouting from his mouth is a large part of the hook for Saget's standup, and he works that discordant mixture hard. Even when a joke or story doesn't get the big laugh, he follows it with another coarse one-liner that is probably funnier just because it's coming from a guy we don't expect to hear talking like that. He'll weave a relatively long story about Full House co-star Dave Coulier's very, uh, personal shaving habits, or toss out a quick throwaway about having "banged" an underage cast member. Saget seems love "banging" humor, and when he talks about his teenaged daughters and their friends he straddles the line of out-and-out shock value, again trading on audience perceptions. For no reason, he'll jump into a sudden need to analyze the accuracy of phrases such as "I'm not sh*tting you" or "f*** that sh*t," and it is funny on a completely childish level. I'm not ashamed to say I found myself laughing. I've seen more polished standup acts, and slow spots like an overlong, one-joke song about his dog licking a certain part of his body beat an initially funny gag a little too hard. He tells a story about he and John Stamos responding to a car accident they witness that leads to an uncharacteristically cute payoff, but it seems to take forever to get there. But Saget keeps a number of callbacks on hand, loosely referring back to jokes about his father, the Six Flags old man, Smeagol, and E.T. between the frequent "banging" humor. Not that I didn't laugh, because I did, at least he until he pulled out a guitar to close the show, which for me seemed to be a momentum killer rather than a way to finish strong. That Ain't Right shakes off an image that Saget seems to love shattering, and while the act has some genuine good laughs, it seems to operate primarily as a vehicle for audiences to get an uncomfortable chuckle out of hearing Danny Tanner talk dirty. Image Transfer Review: The 1.78:1 anamorphic widescreen transfer is a bit on the gloomy side, with Saget's black jacket and the dark backdrop often appearing at odds with one another. The comedian's fleshtones, however, look warm and natural, though audience shots don't fare as well, appearing poorly lit. Not particularly awful, just slightly drab. Audio Transfer Review: Audio is presented in 2.0 surround, and while hardly exceptional, it is workable without being overdone. Saget's delivery is clear, and audience laughter is never overpowering, modestly rising out of the rear channels at times. Extras Review: Extras are limited to Strollin' With Saget (09m:28s), a black-and-white nonamorphic widescreen segment where Saget wanders the streets of New York, offering up a steady expletive-filled stream of observational humor. And much like what Dave Chappelle did for the image of Wayne Brady, Rollin' With Saget (03m:09s) is Jamie Kennedy's rap song about the badass side of Saget. As generally unfunny as I find white guys trying to sound urban, this one actually made me laugh. 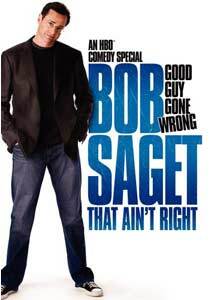 The dark side of Bob Saget gets uncorked for almost an hour here, and the strangeness of hearing the America's Funniest Home Videos star working blue probably makes some of the jokes funnier, just for the whole "this is too weird" factor. Worth a rental, but definitely not with the kiddies within earshot.